We love creating and sharing resources to make classrooms more engaging. We are not alone in that passion. This week, it is our pleasure to collaborate with a kindred spirit, both in terms of teaching experientially, and in sharing resources to help others do the same. 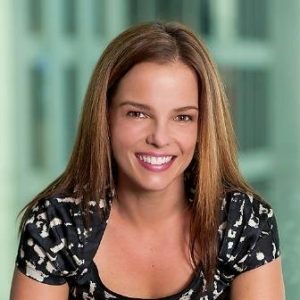 Dr. Colleen Robb is an Assistant Professor of Entrepreneurship and the Associate Director of the Center for Entrepreneurship at California State University, Chico. Check out the fantastic tips, tricks, and lessons she shares on her blog. After reading her post How to Get Your Students to Read Your Syllabus: An Infographic, and given our perspective on co-creating your syllabus, we had to collaborate with Dr. Robb! In her post, copied below, Dr. Robb shares her journey of turning her syllabus into an infographic so students would read and remember it. 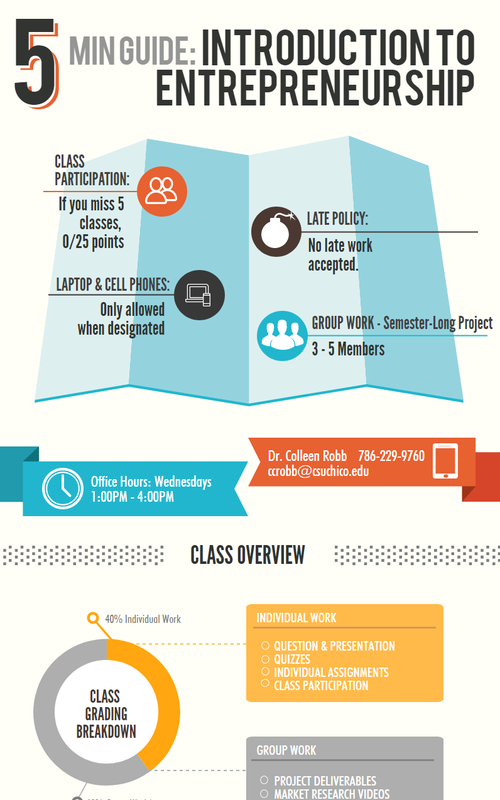 Click to view Dr. Robb’s full syllabus infographic. Like it or not, our students these days are just as distracted as we are. They simply do not take the time to read the syllabus. So, this term, I thought about why that might be. It turns out, I am just as guilty as they are. I don’t thoroughly review the credit terms on my credit cards or the terms of agreement when I buy a song from Apple. Why should I? They all read the same. It’s blah, blah, blah. Well, this term, I decided to up my game and get my syllabus up with the times. I created an Infographic version of my syllabus. I actually decided to upload that image directly to Blackboard so it is the first thing students see. I made a list of all the things students seemed to forget about my class (attendance policy, plagiarism policy, late work policy). I then took all of these frustrations and put them in beautiful, colorful visuals so they would actually look at them. Piktochart is a free site that allows you to create professional looking infographics for any purpose. I made an infographic for my Introduction to Entrepreneurship course so the students understand where the course will lead them. It has been the most successful by far. You can see the full infographic here. Whether this visual tool is used for a class project or an overall class syllabus, the students’ response has been tremendous. For the first time, I’ve had students send me emails that they are aware of the class policies! What appealed to us so much was not just the creativity of Dr. Robb’s approach, but that it very quickly and easily allowed students to understand the structure of her entire course. We love that she saw her syllabus as an opportunity to try something different to better engage her students. As we’ve talked about in a previous post, your syllabus presents a unique opportunity to listen to your students’ problems and to turn those into a plan of attack together. Co-creating your syllabus with your students is an effective way to begin your semester because many students don’t think entrepreneurship will be relevant to them in their career. Through this co-creation process, you can understand the problems that are most salient to your students, and then weave those into the syllabus, so they understand which weeks you’ll be solving problems most relevant to them. Your syllabus is not just a contract between you and your students. It is not just a bunch of words. As Dr. Robb suggests, it can come alive and be a model of how you want your students to think and to act. We so enjoyed learning about Dr. Robb’s approach that we dove into combining her approach of creating an infographic with our approach of co-creating a syllabus. Here’s a quick video extrapolating how these two approaches combine to create an even more powerful approach to engaging your students from day one. 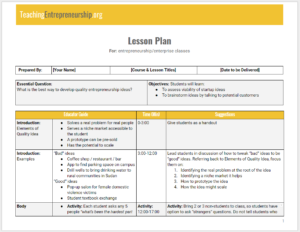 We’ve created an experiential, 45-minute lesson plan to help you co-create your entrepreneurship syllabus with your students. It’s free for any/all entrepreneurship teachers. Please feel free to share it. All we ask is that you leave us some feedback on it so we can improve it! And don’t forget to check out Dr. Robb’s blog for more resources and guidance on making your classroom experience more engaging! If you’re working on an innovative way to impact students in your class and want to share with the 1,500 members of TeachingEntrepreneurship.org, let us know. This is an experimental collaboration, and if it works out, we may do more like it! In an upcoming post, we will interview co-founder Justin Wilcox! Please subscribe here to get that post in your inbox.